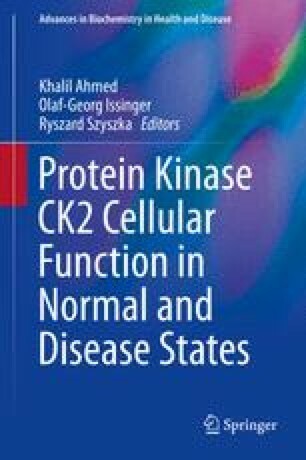 Various compound libraries of the Drug Therapeutic Program (DTP) of the NIH/NCI were screened against the catalytic subunit and the tetrameric holoenzyme of protein kinase CK2. Different IC50 values were obtained for the two CK2 molecules. In the case of nortangeretin, the IC50 value was 0.34 μM for the catalytic subunit and 15 μM for the holoenzyme. In the case of coumestrol, opposite results were obtained, i.e., high IC50 for the CK2α subunit (2.7 μM) and a lower IC50 value for the holoenzyme (0.19 μM). From the many compounds identified to inhibit CK2, we have selected 14 different compounds and listed them according to their CK2α/CK2 holoenzyme IC50 ratio. Four compounds were tested on a panel of seven cell lines revealing considerable differences in the degree of CK2 inhibition inside the cells. We thank the Drug Synthesis and Chemistry Branch, Developmental Therapeutics Program, Division of Cancer Treatment and Diagnosis, National Cancer Institute, USA, for providing us with plated and vialed samples from the various compound sets. The advice of Dr. David Newman at the start of the investigation is particularly acknowledged. We also thank the many students who have been involved in some of the screenings presented in this report. This work was supported in part by Grosserer M. Brogaard og Hustrus Mindefond and the Danish Council for Independent Research-Natural Sciences (grant 1323-00212A to B. Guerra), the Danish Cancer Society (grant 252-1109-210), and the Danish Research Council (grant 21-04-0517) to O.-G. Issinger.